I’ve seen some other bloggers wrote a blog about countries or places that they want to visit, I thought I may aswell do one. These are in no particular order, and in some countries/ places I have no specific area that I want to visit, I just want to. NEW YORK: I what to visit New York to see the amazing skyline and buildings of New York. Where I am from, these don’t exist. I also want to visit the many Museums. SAN FRANCISCO: I think the city itself seems really nice, with the long steep roads and the architecture, to me it seems like a beautiful city. THE GRAND CANYON: It would be amazing to see. GERMANY: From films that I’ve seen from Germany, I think the countries architecture is really nice. I love the traditional houses. SWITZERLAND: I want to visit the gorgeous mountains and maybe go skiing. I also love the log cabins; I can just imagine myself there; with fluffy pyjamas on, a lovely roaring fire, a hot cup of tea and with the snow falling outside. AUSTRIA: Again, I would like to see the architecture, but also visit the concentration camps. They would be so interesting to see and you would learn so much about what happened there. ITALY: I once saw a movie that starred Giovani Ribisi ( Frank from Friends) and ever since seeing the countryside from the film, I’ve always wanted to go. JAPAN: I want to see how different Japan is to China; it’s houses, people, food, customs and more. VIETNAM: Ever since watching the programme called ‘Top Gear’ where the presenters had to get from South Vietnam to North Vietnam on 2nd hand motorbikes, I have always wanted to visit. NEW ZEALAND: I want to visit the set where Lord of the Rings was made, and see the lovely scenery from the movies. I would be pretty shocked if I managed to visit all of them in my lifetime, but I can dream. Maybe I might win the lotto? But take everything one step at a time. At the moment I’m quite close to Japan and Vietnam… So maybe I could one day visit those countries. My life has now been consumed by the thought of HOLIDAYS. Myself and my boyfriend are going to Mexico ( his hometown) for a month in December. I can’t wait! Each day I am counting down the day we leave. We are going to visit his parents and do some sight seeing. It was quite difficult to get the time off work, but I managed it. Now the only problem, it’s only October. I still have 40 something days to wait. So then, after my contract finishes, we hopefully will go to Ireland in around April. My sister is having a baby in February so I definitely have to come home and visit. My initial plan was to go home in December, but then I decided to postpone it until after my sister has the baby so I would be able to see him/her. It will be good to visit home. I’ve been missing it the past few weeks. I think it’s because I know I won’t be there for Christmas. Last year I was in China and I worked Christmas Day, so it was a very sad day indeed. I remember Skyping them that night and the feeling of loneliness and missing out was awful. At the time, I promised myself I would be at home next Christmas. But il be in Mexico and I WON’T be working. Already it’s better than last years. I just wish the days would hurry up. I’ve been living in China for over a year now. Sometimes it’s hard to believe, but there you go. The first few months of living here, it was definitely a culture shock. After I got used to that, things sort of got, well, normal. The food was normal, the people were beginning to feel normal and their way of life; I was getting used, or conditioned to it. Then the feeling of, not so much as anger, but more of an irritation of China began to creep in. Although I am not saying China is a bad place, not at all. I’ve lived here for a year already, and plan to for another one. But I think your opinions and feelings are continuously shaped my events happening around you, people you’re with, and just your general state of mind. I think my feeling of irritation is being directed at Chengdu. Maybe I need to experience and live in another part of China. One of the worst aspects of Chengdu is definitely the weather. Now I know Ireland is famed for it’s rainy weather, but in Chengdu, it’s rare to see even a hint of blue sky. In Ireland, although it may be freezing, sometimes there would be no clouds and it would be so sunny and nice. In Chengdu the weather is terrible. Fog, fog, and rain. That’s literally it. Oh and the pollution. We can’t forget that. The weather changes the mood of everyone, especially in Ireland, where everyone has this euphoria. It is a great place for expats to live however. If you are a first timer going to live in China, I think Chengdu is a great starting point. There are loads of other expats about. Large bar street dedicated mainly to foreigners. Plenty of language schools so it’s easy to find a job. Transport system is easy to navigate; mainly talking about the subway here. Lots of Western restaurants: Petes Tex Mex, Mikes Pizza, Grandmas Kitchen, Helens Bar & Restaurant. So, if you an individual who gets affected by the weather, don’t come to Chengdu. 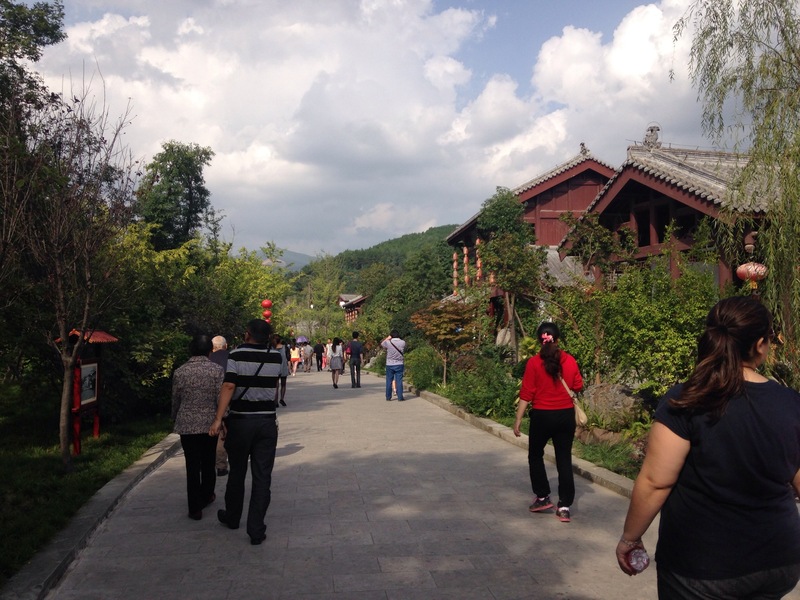 Here are just a few photos that I took when we went to Guangyuan. 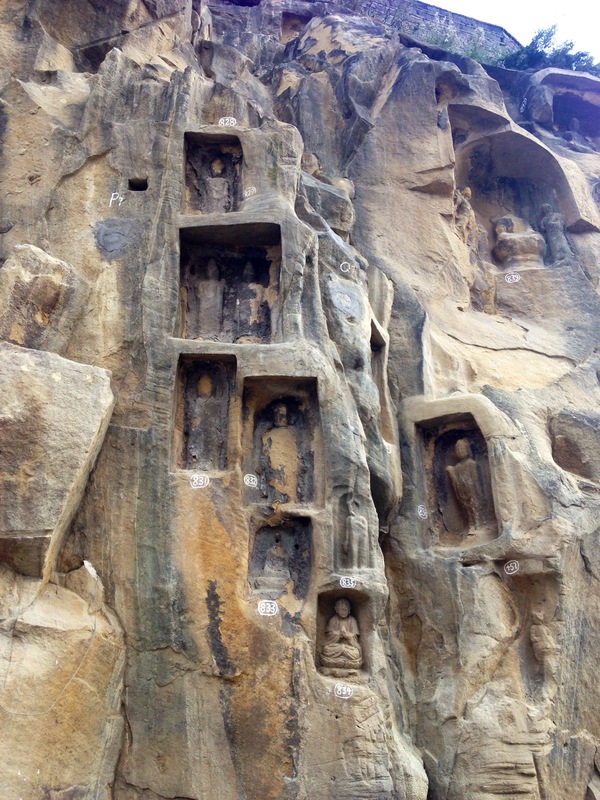 I have seen these rock carvings both in Chongqing and also in Leshan, where the Buddha is. 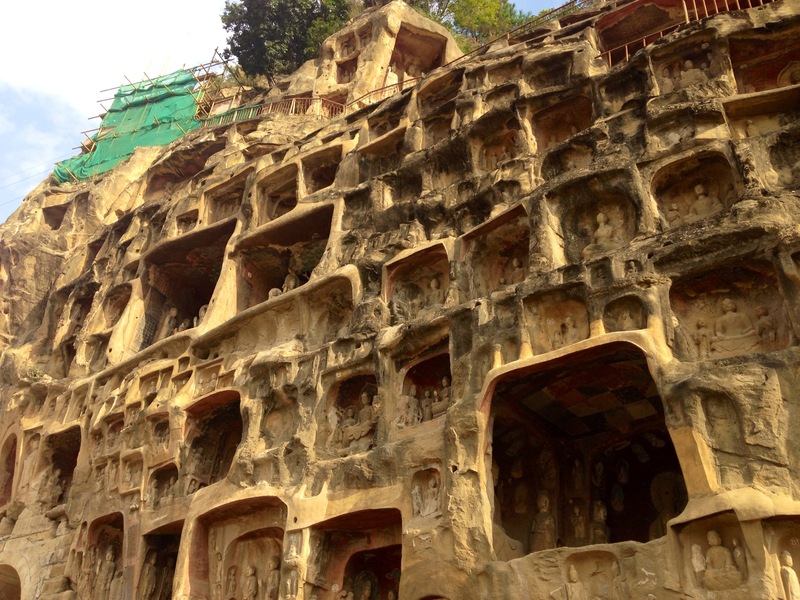 Sadly a lot of carvings have been eroded due to the rain, but they are pretty impressive. Lately myself and my boyfriend have been talking about what we will do after our contracts have ended. I tell you, its a bit of a dilema. Learning the Language. We really want to learn Mandarin. We made a pact that we would put more effort into studying it, so we can find out how much we can learn if we actually tried. I really want to learn a 2nd language, because I know it will benefit me in the future. My boyfriend speaks Spanish and English so he’s it’s great for him, whereas I know English, basic Irish, French and Mandarin. So I may get starting with my Mandarin. Visit other places. Yes I know Sichuan is great and there is loads to do here, but it would be great to see more of China. It is such a huge country with some beautiful places, it would be a shame not to visit them while I am here. Im becoming bored of Sichuan and Chengdu and Im itching to experience more places. 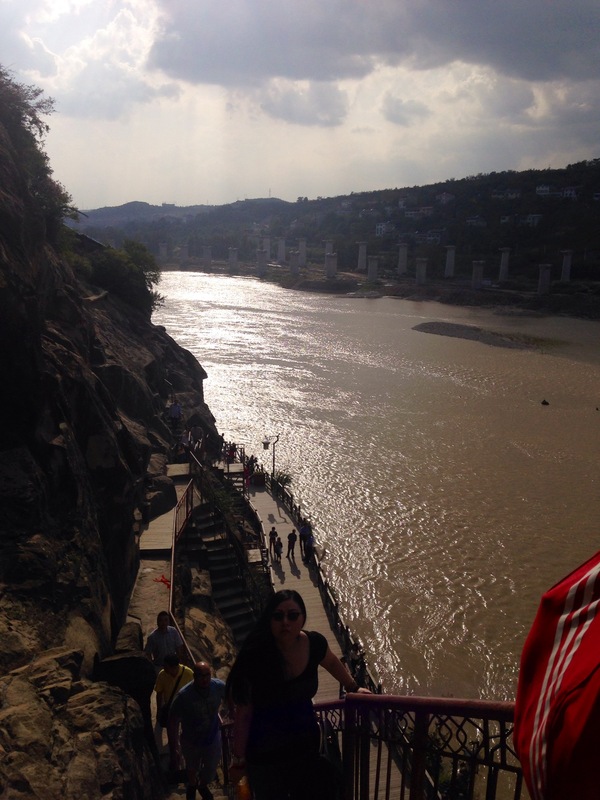 I have a list of why I don’t want to stay in China, but that will have to wait for another post. So… our plan, our very rough plan, is maybe to finish both our contracts, then decide to work in a different city in China. I know our company has a few other campuses in other cities, so they are possibilities. It would be nice to be located in South China; the weather is better and you are closer to Vietnam, Laos, Cambodia and Thailand making it easier to travel to those countries. So work again for another year and maybe, just maybe we might go to Japan and work there. Now these are all just ideas, and we have no idea if they will materialize, but its nice to dream. I have another 5-6 months left on my contract so we still have plenty of time to decide what we want to do. But, change is good. Monotony is bad. China is recovering from its National Day holiday, so that meant it has has been mad here the past few days. This also meant that quite a lot of my teaching classes were cancelled. So myself and a few friends decided to do something seen that our company were so kind as to give us an extra day off. You know, most other companies give 3 days off, but unfortunately our company isn’t as forgiving. Because it was literally only organised the day before our holidays,we decided to go to a little city North of Chengdu about 4-5 hours by train. All the major tourist destinations would be too busy, and anyway, it would be unlikely we would get tickets in such short notice. 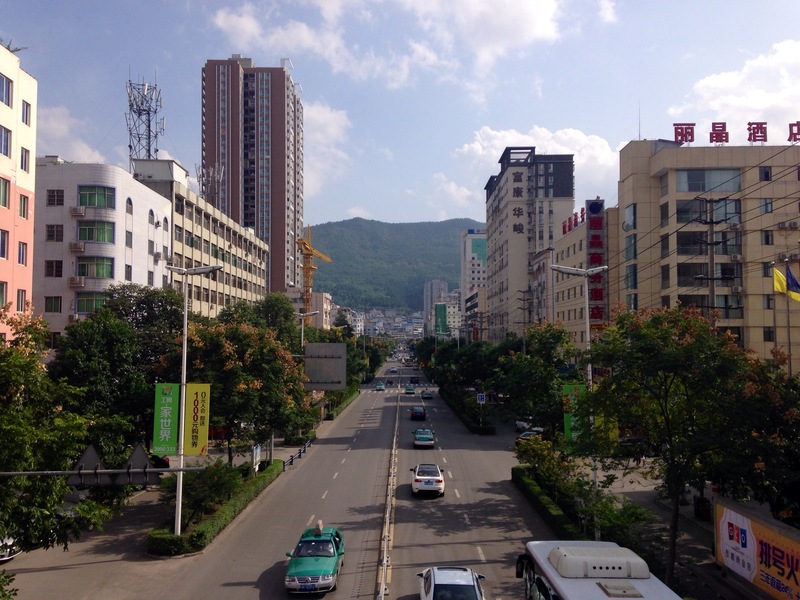 In comparison to Chengdu, Guangyuan is tiny, with a mere 1-2 million people living there whereas Chengdu has around 14 million. This meant plenty of stares by the Chinese. Im not sure if they see many foreigners around their area. We decided to stay in a 5 star hotel up a small mountain for two nights. It was incredibly cheap, and it was brand new so we were very lucky. Behind it, it has two big outdoor hot springs, with smaller ones dotted around the area. At the far back, they have a huge wave pool, although there was no water in it because the hotels not even ‘officially opened’ yet. They also had 2 big slides and an huge indoor pool. I presume they intend on having a lot of guests in the future. The whole area around it was lovely, surrounded by mountains; the sky was blue and the air was so clean and fresh. Such a difference from Chengdu. 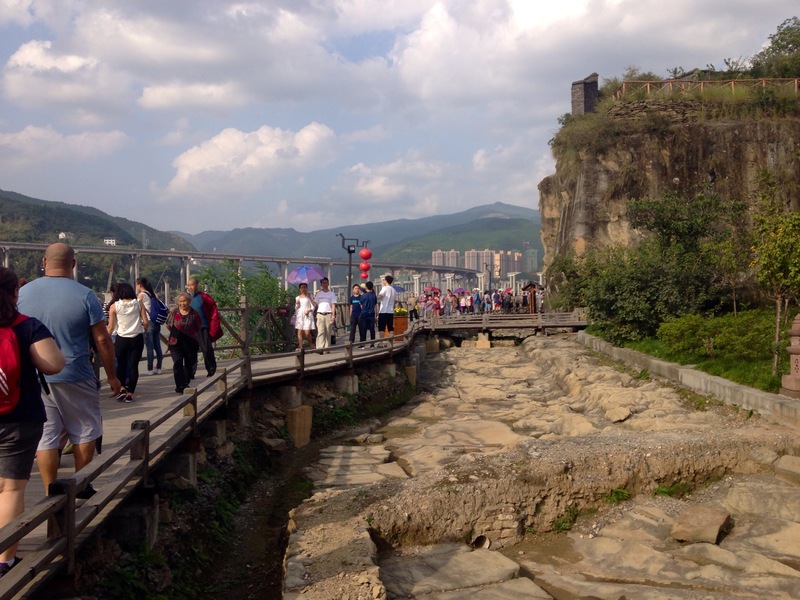 While we were there, we decided to visit a little temple area, where there were carvings on the rock wall quick similar to the ones I have seen in Chongqing and at the Buddha in Leshan. Its unbelievable to think thousands of years ago that they were capable of carving statues in the rock that are 100 feet high. We only stayed in Guangyuan for 2 days then we got the train back home. We did contemplate going to Xian, where the Terracotta Warriors are located, but we decided no. This time last year I went there and it was crazy. I vowed never to go again to a touristy place when there is a holiday. It’s not worth it. When we have time, me and my boyfriend are planning to visit Jiuzhaigou National Park. I visited last October and it was beautiful. I know he would enjoy it, and I would to see it again, so hopefully we’ll be able to go.